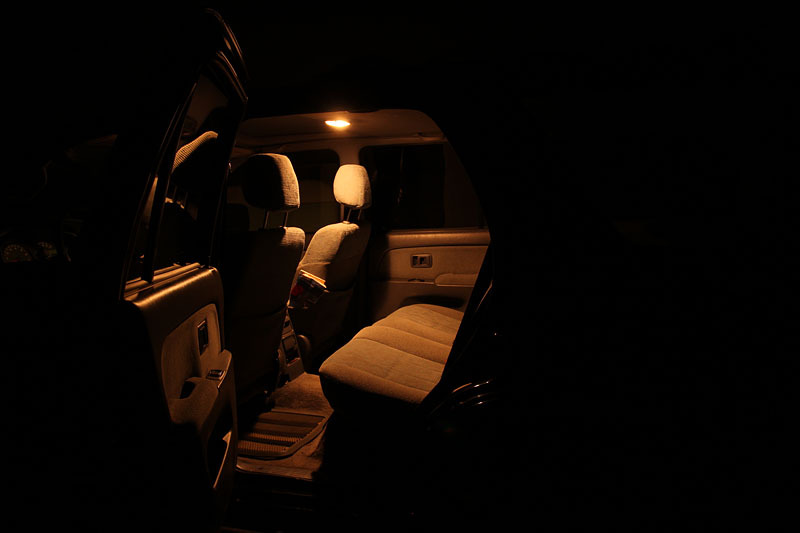 The stock interior lights in the 4runner are rather dim 5w bulbs and I wanted better lighting both in the cargo area and behind the truck to help when setting up camp after dark. Modern LEDs such as the Cree XR-E are very efficient and put out a large amount of light relative to an incandescent bulb, and they can be swapped in for about $10 per light. There are a lot of detailed articles about high power LEDs on the interweb so I'm not going to go into too much detail here and instead will just quickly touch on the two major differentiators, output and color temperature. Output (luminous flux) is measured in lumens (lm) and indicates how much light the LED puts out for a given amount of input power. Color temperature is measured in degrees kelvin and indicates the color of the light. When a manufacturer produces a run of LEDs they are grouped by color and output into "bins". For example, Cree LEDs are given a set of codes such as "P4 WG" where P4 indicates the output bin and WG indicates the color temperature bin. There are charts you can use to look up the exact min/max lumens output and color range for each bin. It's important to know that the brightest LEDs also tend to have very cool, bluish color temperatures and may have 25% more output than a warmer colored LED. The problem is that our eyes are optimized for sunlight and are more responsive to warmer colors, which can make a LED with a lower color temperature look more natural. After trying both cool (6000K) and warm (3000K) LEDs I strongly prefer the warm LEDs even though you give up a little in measured light output. 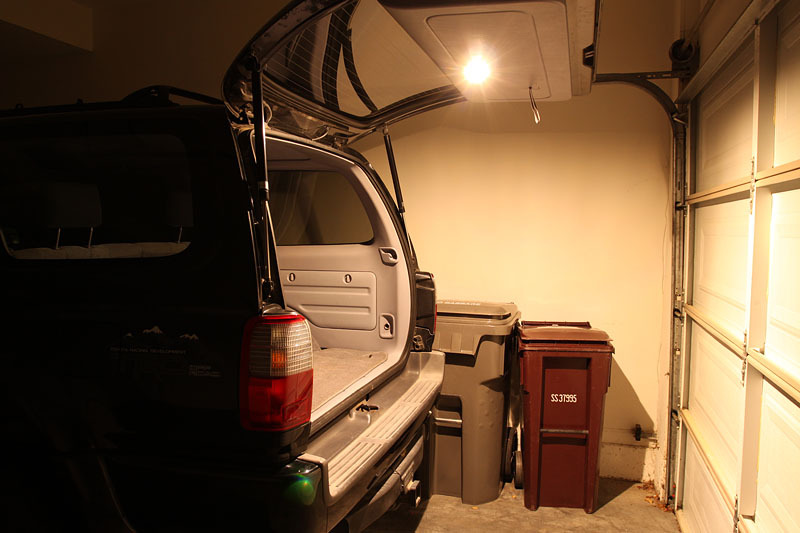 For this project I picked a pair of Cree XR-E P4 3000K warm white LEDs which run about $6 each. Most power supplies you run across are voltage sources and deliver a fixed voltage into the load. For consistent light output and to prevent damage LEDs need to be run on a current source, which is a power supply that varies its voltage to always provide the same amount of current to the load. There are many types of current sources with different input voltages relative to the load voltage (buck vs. boost) and efficiencies (linear vs. switching), and as with LEDs there are a lot of articles out there if you want details. You can build your own linear current source using a LM317 type voltage regulator, but it's cheaper and easier to purchase a ready made part. For a Cree warm white LED the recommended maximum current is 700 mA. This is a good balance between output, heat generation, and longevity. The MR16 current regulator supplies the LED with ~680mA, is reasonably efficient, and a great deal at about $2.50. The same supplier also sells similar units that can drive multiple LEDs. These drivers have an input range of 8-40V so they are ideal for use with a cars 12v system. 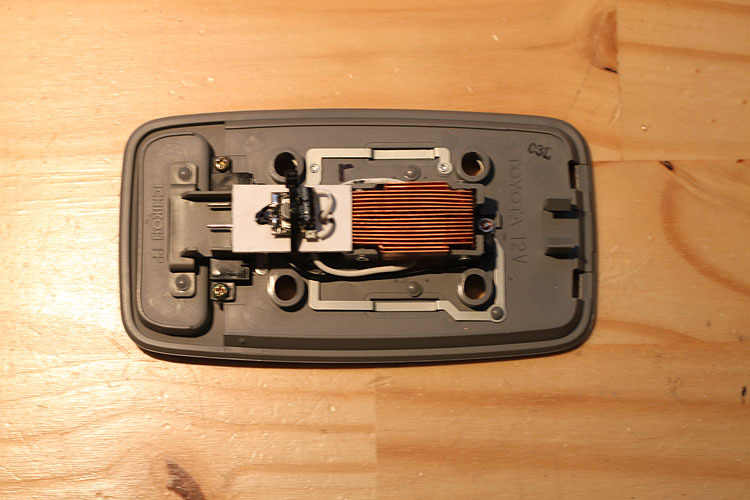 The stock 5w hatch lamp draws 0.357A @ 12v which is 4.3w. The led/driver combination draws 0.22A @ 12v which is 2.64w. This means that the LED is MUCH brighter than the incadescent bulb while only using ~60% of the power. Wiring is very simple. The input on the driver is the two metal pins and they are designed to run on AC so polarity doesn't matter (you can remove the rectifier diodes to gain a bit of efficiency but I didn't think it was worth the hassle). The output is DC and you just need to attach the positive output to the positive terminal on the LED and the negative to the negative. That's it. The hard part of this project is tapping into the switched ground in the truck that is closed when the hatch is opened. Here are the parts I used. Ok, enough with the technical part, here are some pictures. There are more at the link at the top of this page. 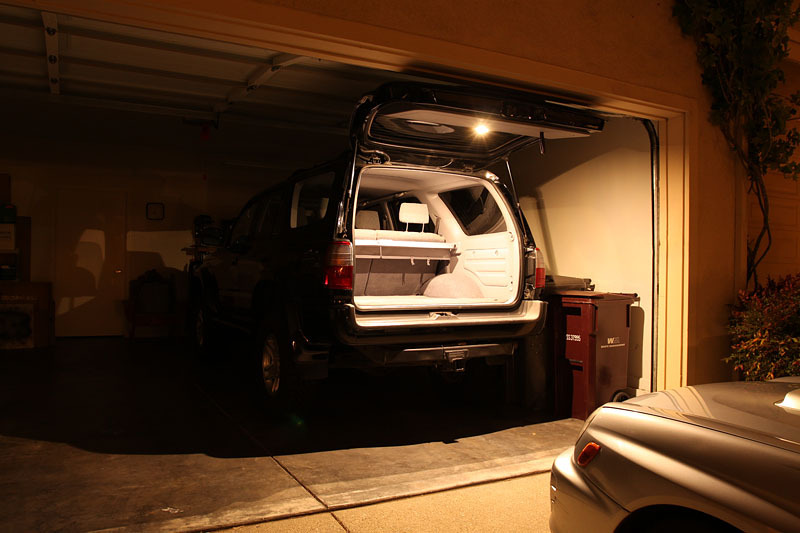 The stock rear hatch light uses a 5w bulb. 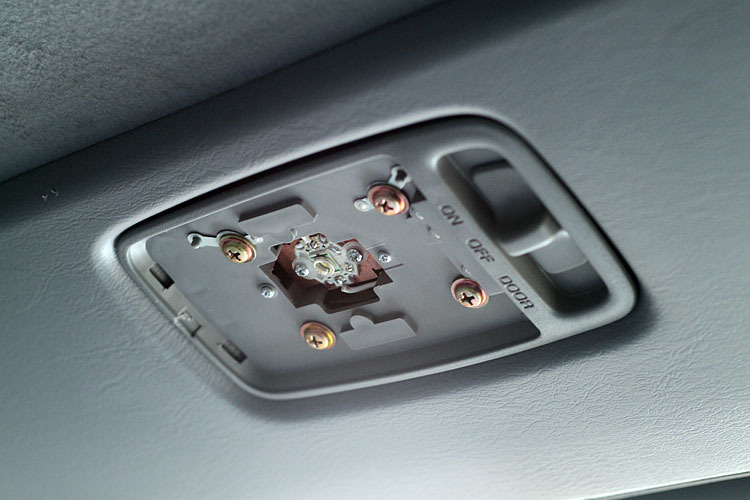 The metal rings on the front provide a constant ground, and the two pins on the input connector are constant 12v and a ground that is switched by the rear hatch. When the slider is in the "on" position it connects the bulb ground to the constant ground, when it is in the "door" position it connects the bulb ground to the switched ground. 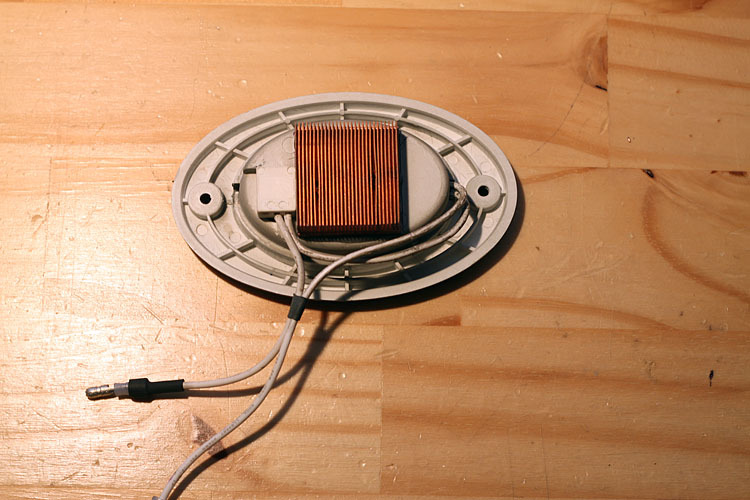 I removed the stock bulb and bulb holders and replaced them with a copper heatsink and the LED which is mounted using thermal paste and screws. The screws make it easy to swap out leds in the future, I only had to chip out a expoxied on LED once to learn that one. 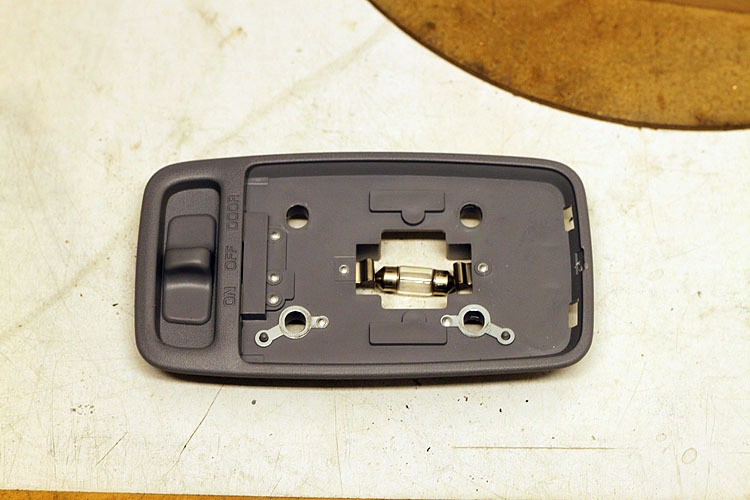 The light assembly fits into a narrow gap so it's important to keep the electronics between the screw holes. I used a small piece of plastic and a zip tie to mount the driver and used ring terminals to connect to the +/- terminals. Installed and ready to go. With the cover on you can't tell anything has been changed. 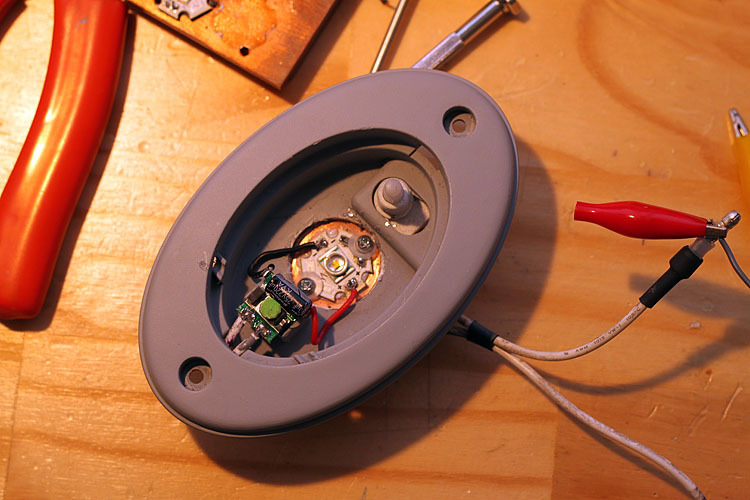 The hatch light is a bit more complicated because it does not reuse an existing light. 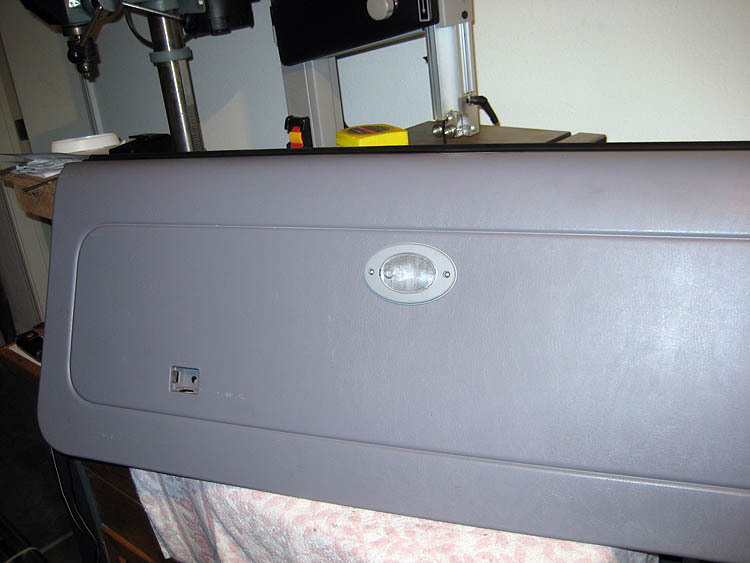 I mounted the LED on a heatsink and epoxied it to the housing which I painted gray to match the truck's interior. The driver is hot glued in place. The switch you see allows you to tap the cover of the light to turn it on and off. This heat sink is overkill, but oh well. 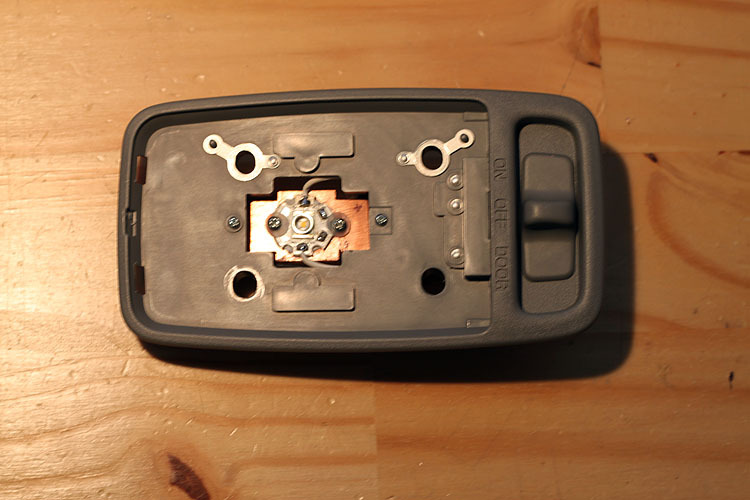 I used a combination of probing and a wiring diagram to find the required connections in the rear hatch. 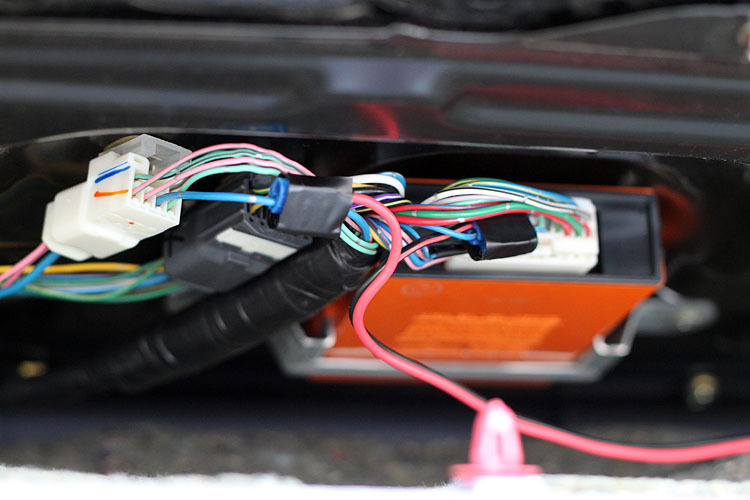 The blue wire on the left provides a constant +12v and the blue wire on the left is switched to ground when the hatch is open. 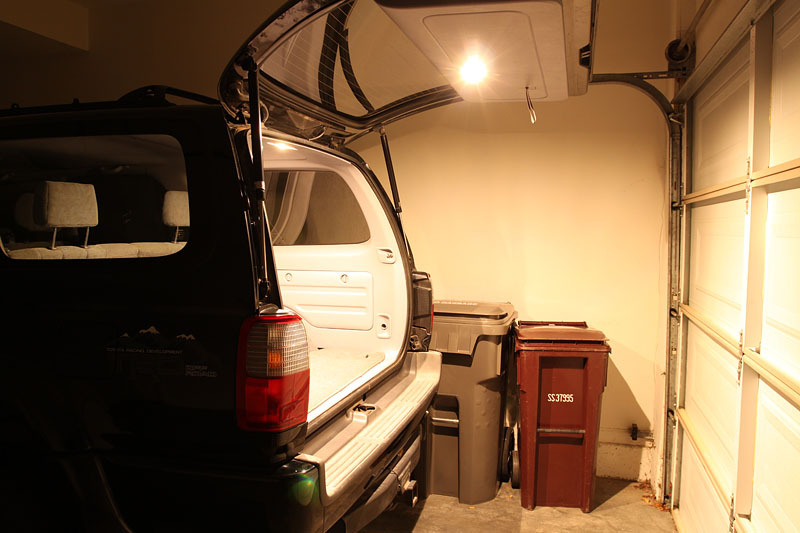 Here's the light mounted in the rear hatch. The final outcome worked out really well and is a lot brighter than the stock lights. 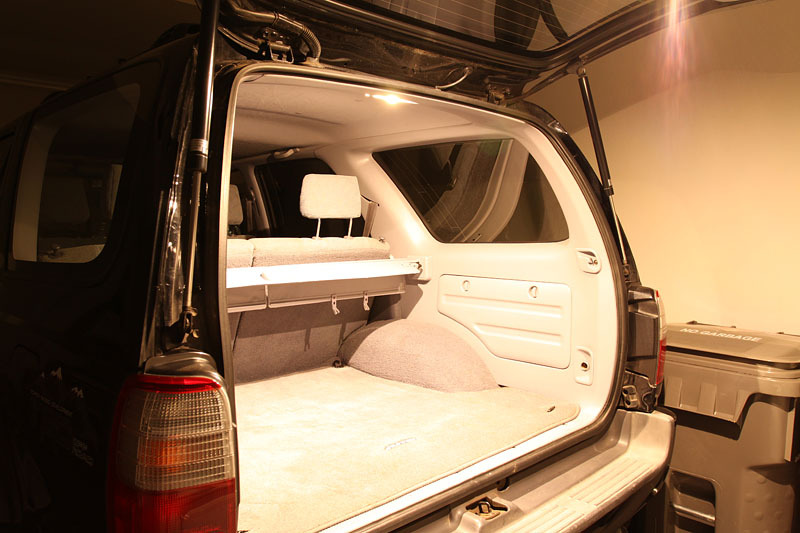 Here's the stock 5w bulb above the rear seats. Please note that all of the rest of these photos were taken with the exact same exposure settings so you can compare light level and color. And here is the hatch light only, again this is with the exact same exposure settings as above. The hatch light and the trunk light both on. This is going to be great for camping. And finally some outside pictures. 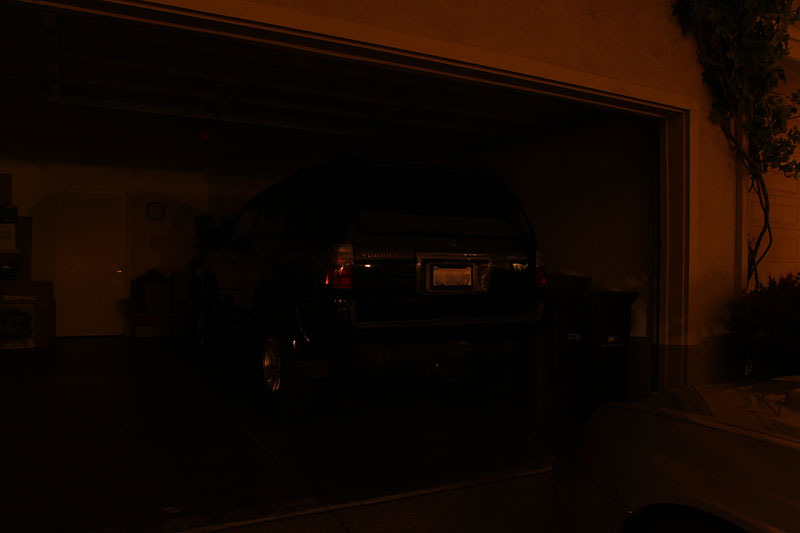 Here's the ambient light so you can get a feel for how dark it was. And with both LEDs on.